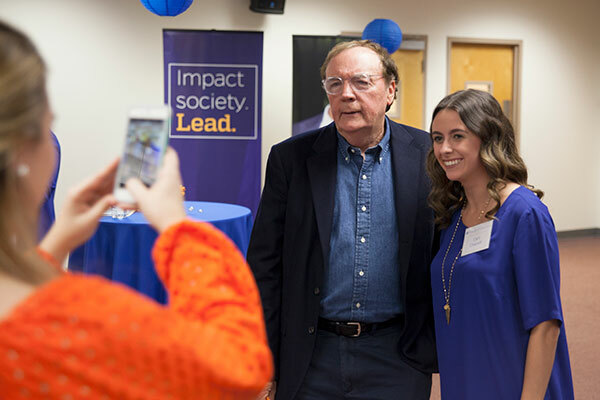 Best-selling novelist-philanthropist James Patterson poses for photos with COE students during a visit to Norman Hall last October. having the means to support literacy causes across the nation and, most recently, in his home state of Florida. On Monday (Feb. 26), at a luncheon gathering of state education leaders, legislative officials and other supporters atop the 22-story executive tower of the State Capitol, Patterson joined University of Florida educators in announcing his $3 million contribution to the university’s College of Education and the kickoff of its ambitious literacy initiative aimed at doubling the number of schoolchildren in Florida who can read proficiently. UF professors steering the effort have dubbed the initiative the James Patterson Literacy Challenge. “We chose the James Patterson Literacy Challenge name not only to recognize the donor’s generosity, but to acknowledge the challenges faced by struggling readers and their teachers,” said UF education professor Holly Lane, who is heading the literacy acceleration effort. 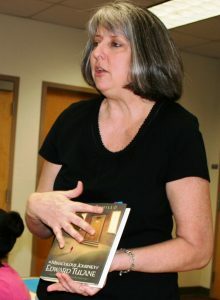 Lane also directs the UF Literacy Initiative at the College of Education. Patterson is best known for his many enduring fictional characters and suspense-thriller series like Alex Cross and Women’s Murder Club. His latest books are “All-American Murder: The Rise and Fall of Aaron Hernandez” and “Fifty-Fifty,” the second installment in the Harriet Blue detective series. Working through his Patterson Family Foundation, the novelist also is well known for his philanthropy supporting higher education, literacy instruction, keeping libraries well stocked, and book-reading by people of all ages. His latest $3 million donation to UF follows on the heels of gifts worth $432,000 that he has made over the past five years to fund UF scholarships for 21 future teachers with a strong interest in reading instruction. Associate Professor Holly Lane, shown teaching in her literacy education class, will lead the James Patterson Literacy Challenge initiative. Lane said more than 40 percent of Florida’s third graders have been performing below the benchmark passing score for reading on the Florida Standards Assessment. She said low-performing schools commonly face two major obstacles in their literacy programs: Many children arrive at a school unprepared for the reading expectations of their grade level and many teachers are unprepared to address their needs. According to Monday’s announcement, the Patterson-funded literacy project will be launched first in two Florida school districts—one in UF’s campus locale of Alachua County and a second district yet to be announced. She said the UF approach involves powerful professional learning activities and coaching for teachers. A core feature is a web-based professional development resource to help teachers learn effective methods for assessment, instruction and intervention in foundational literacy skills. The online resource will be hosted on a comprehensive web platform being developed by the college’s Lastinger Center for Learning. Participating teachers will be able to upload instructional artifacts and video examples of their teaching for review by a UF literacy coach or sharing with other participating teachers. “Our vision is to make the online resources accessible to any Florida reading teacher by the end of the year,” Lane said. Each partnering school district will target up to five underperforming elementary schools. UF faculty researchers and doctoral students will work with each school to assess their current literacy practices and then develop literacy acceleration plans tailored to meet their needs. The college will provide a UF-trained master teacher for each district to provide coaching and ongoing professional development, according to Lane. The master teachers also will lead summer workshop academies for the participating educators. Lane said plans call for expanding the literacy initiative to additional Florida school districts during year 2 of the project. “Through the James Patterson Literacy Challenge at UF, we envision that schoolchildren across Florida and beyond will be guided by teachers who know how to maximize literacy growth and foster the love of reading in children that can influence every aspect of their lives moving forward,” Lane said.